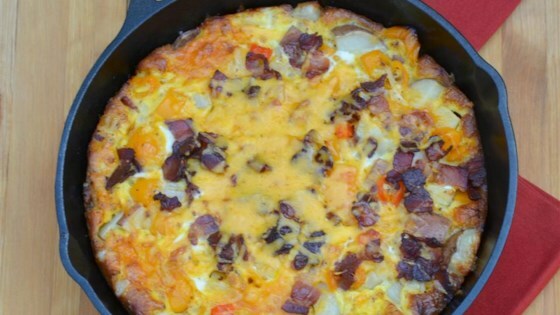 "A hearty breakfast casserole that packs in plenty of veggies, meat, and topped with warm cheese. Add any cooked breakfast meat you would like instead of bacon. Top with salsa for a fresh kick." Place bacon in a large skillet and cook over medium-high heat, turning occasionally, until evenly browned, about 10 minutes. Drain bacon slices on paper towels; crumble into pieces. Preheat oven to 425 degrees F (220 degrees C). Grease bottom and sides of a 9x13-inch casserole dish. Layer potatoes, red bell pepper, orange bell pepper, onion, and jalapeno pepper in the casserole dish. Sprinkle 1/2 cup Cheddar cheese on top. Scatter bacon pieces over the cheese. Whisk eggs, milk, garlic powder, black pepper, salt, and paprika together in a large bowl. Pour over layers in the casserole dish. Bake in the preheated oven until set, about 35 minutes. Remove from oven and top with remaining 1/2 cup Cheddar cheese. Continue baking until cheese is melted and golden, about 10 minutes more. 1 tablespoon of pepper was to much for our taste. Thinking it should be 1 teaspoon. Next time I will put bacon on top of potatoes to keep it from getting to crispy. I used browned hash browns on the bottom and cooked hot sausage instead of bacon. Seriously delicious!!! We didn't have left overs! Great recipe! Should have made it in a smaller casserole dish so it would be thicker.My husband has leftovers for two lunches. I have a bunch of bacon left so I may make it tonight!